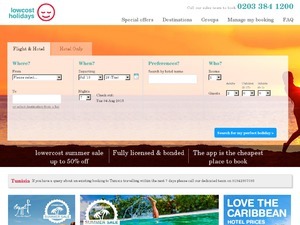 Search for cheap all inclusive holidays, last minute deals & city breaks on lowcostholidays.com. Get low deposits & huge discounts. Book now, ATOL protected. Offer condition: Must include flights and accommodation. This voucher code can only be redeemed once, at the time of booking and cannot be used in conjunction with any other voucher code. Do not miss another lowcostholidays voucher! Simply leave your e-mail address and we'll always keep you informed of new vouchers for lowcostholidays. Duration must be between 7 and 8 nights only. £30 discount per booking. Must include a Norwegian or Monarch flight. Offer condition: Code valid for bookings made between 1 July and 31 August 2016. Travel must be taken between 1 July and 31 August 2016. Duration must be between 7 and 8 nights only. £30 discount per booking. Must include a Norwegian or Monarch flight into the following airports only: Alicante/Corfu/Faro (Algarve)/Fuerteventura/Gran Canaria/Lanzarote/Larnaca/Malaga/Palma (Majorca)/Paphos/Tenerife South and from MAN or LGW only. This voucher code can only be redeemed once, at the time of booking and cannot be used in conjunction with any other voucher code. Offer condition: Must include flights and accommodation. Code only valid on Malta Holidays. This voucher code can only be redeemed once, at the time of booking and cannot be used in conjunction with any other voucher code. Offer condition: Must include flights and accommodation. Minimum 1 adult and 1 child per booking. This voucher code can only be redeemed once, at the time of booking and cannot be used in conjunction with any other voucher code. Offer condition: Valid on All Inclusive Flight + Hotel bookings until 7th July. Minimum spend £900. This voucher code can only be redeemed once, at the time of booking and cannot be used in conjunction with any other voucher code. Offer condition: Offer valid 30 May to 3 July 2016. Must include flights and accommodation. This voucher code can only be redeemed once, at the time of booking and cannot be used in conjunction with any other voucher code. Hurry - our June Sale is here. Plus, get an extra £20 off with code JUN20. Min 7 nts duration, flight + hotel, ends 24th June. Offer condition: Hurry - our June Sale is here. Plus, get an extra £20 off with JUN20. Min 7 nts duration, flight + hotel, ends 24th June. This voucher code can only be redeemed once, at the time of booking and cannot be used in conjunction with any other voucher code. Offer condition: Valid: Friday 3 June - Monday 13 June 2016. Book by midnight 13 June 2016. £75 discount per booking, must include flights and hotel on all inclusive board basis, min spend £1100. This voucher code can only be redeemed once, at the time of booking and cannot be used in conjunction with any other voucher code. Offer condition: Minimum 1 child. Must include flights and accommodation. This voucher code can only be redeemed once, at the time of booking and cannot be used in conjunction with any other voucher code. Offer condition: Holiday must be taken in March and/or April. This voucher code can only be redeemed once, at the time of booking and cannot be used in conjunction with any other voucher code. Offer condition: This voucher code can only be redeemed once, at the time of booking and cannot be used in conjunction with any other voucher code. Latest voucher code valid at a time of promo publication was entered to be working from 2016-07-05.